Aluminum Foil Tape is coated with acrylic or rubber adhesive and available with or without release paper. These foil tapes are available with 25 mic-100 mic thickness. We also laminate this foil with Polyester film for special application and uses. We also laminate this foil with Polyester film for special application and uses. FSK foil Tapes and Vapor Tapes are also a kind of Aluminum foil tapes. Our domain expertise has enabled us to come up with a comprehensive range of quality-assured Self Adhesive Aluminum Foil Tape, which is coated with the synthetic acrylic adhesive. This tape is widely used to provide moisture barrier with heat transfer wrapping to the pipes. The offered array of self adhesive aluminum foil is highly appreciated among the clients for its high tensile and dielectric strength. Clients can avail these tapes from us various width such as 12, 18, 25, 38, 50, 75 mm and 20 & 50 meter length. 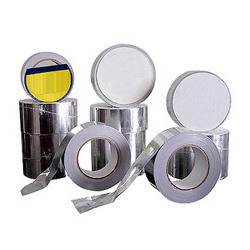 We are Manufacturer, Exporter and Supplier of adhesive Self Adhesive Aluminium Foil Tapes. Our Aluminium Foil Tapes are used to join tubes, refrigerator, water heaters, air conditioner and many more. 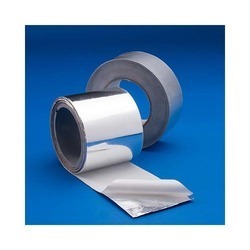 These Aluminium Foil Tapes are coated with acrylic adhesive that are served with or without release Paper, as per the requirements of the customers. We can also provide a wide variety of adhesive coated Aluminium Foil Tapes according to the needs of the customers. Our Aluminium Foil Tapes are available with 25 mic-100 mic thickness. We also laminate this foil with Polyester film for special application and uses. FSK foil Tapes and Vapor Barrier Tapes are also a type of Aluminium Foil Tapes. Aluminium Foils are widely used in tubes and lead jointing for air conditioner, refrigerator and water heaters. 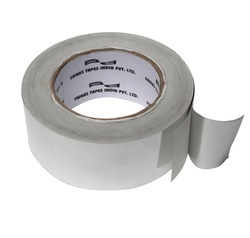 An extensive range of Foil Tape can be availed from us, which is known for its high adhesive quality. We use world-class materials to manufacture such a range of industrial tapes that enhance its durability and longevity. These industrial tapes can be used for packing goods, electronic devices, mobiles and many other industrial applications. Our comprehensive range of industrial tapes also finds its applications in building, printing, automotive and construction industries. Customers can avail from us a qualitative range of Adhesive Butyl Rubber Laminated Aluminum Foil Tape, which is ideal to use in moisture barrier, heat transfer and uneven surfaces. Our experienced professionals manufacture these tapes using superior-grade aluminum foil which is coated with the butyl rubber compound. Clients can avail these tapes from us in various sizes, quantity and other specifications. With the help of our experienced and qualified professionals, we are offering a comprehensive range of Vapor Stop Laminate Foil Tape to the honorable patrons. Manufactured using excellent quality aluminum foil and polyester film, this is a vapor barrier foil. This vapor stop laminate is bonded using optimum quality synthetic adhesive. Offered array of vapor stop laminate is widely used to block vapor in insulation systems.